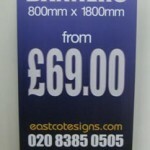 Welcome to Eastcote Sign & Display.Whatever your needs for banners, signs, hoardings and vehicle graphics, our experience in the industry means that we supply and install high quality signage and displays for our clients. 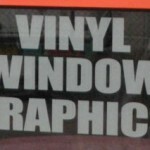 We use the latest equipment including vinyl cutters and Roland wide format digital printers to deliver consistent and reliable print quality. 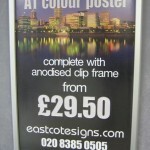 Find examples of our previous work under the relevant product pages. 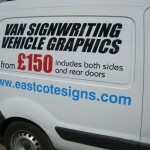 We have designed and applied vehicle graphics to many different types of vehicles, from small vans to HGVs. 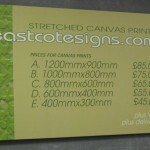 See examples of our van signwriting work on our vehicle graphics page. 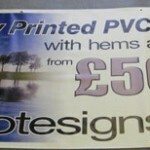 We have produced banners from 1m long up to 10m long. 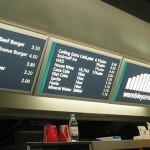 Our banner clients include CarGiant and Wembley Stadium. 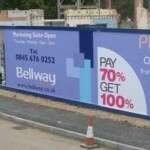 Bellway Homes and other construction companies ask us to design, produce and erect construction hoardings for their development sites. A really smart way to put a picture on the wall. Makes a great gift too! 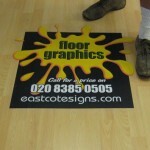 A low cost and easy to update method to make the most of floor space. 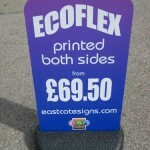 Portable weatherproof signage suitable for any business or event. 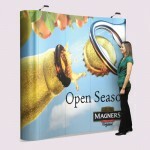 Convenient and portable signage suitable for conferences and events. A versatile way to grab attention from the street. 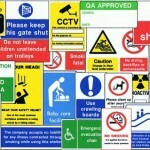 A wide selection of health & safety signs to choose from.